Modern biology is revolutionizing the lives of every human, and yet few people understand the science that is resculpting their existence. This is, if you think about it, an unstable situation. It tends to breed fear. This You better not fool with Mother Nature response is nowhere more evident than in the recent bestselling novel Oryx and Crake, by Margaret Atwood, well known author of The Handmaids Tale. She recounts a world where genetic tinkering has unleashed a deadly virus that sweeps the globe. A tribe of naked, benign, green-eyed mutant survivors of this global catastrophe — they look like children, but seem too simple, too blank, to be human — forms the frame of Atwoods story, which focuses on Crake, sort of a modern-day gene jockey Frankenstein. Crake had been working with human embryos, altering the ancient, primate brains to eliminate destructive features, when the virus epidemic hit. Crake has the ambition of a God. He has set about engineering a better version of humanity, and his childhood buddy Jimmy is selected to play a key role, as is Jimmys childhood puppy love, the beautiful Oryx. 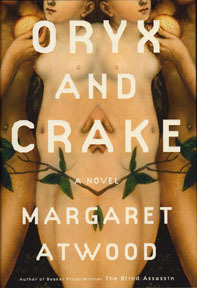 It would ruin all the fun to explain just what Crake is up to, but Atwood clearly intends his shenagans to be a cautionary tale of science run amok. In a world of bioengineering, cloning, tissue regeneration and the like, she strikes an unambiguous warning note. In interviews with the press after publication of Oryx and Crake, Atwood is quoted as saying Its all possible right now, every bit of it. By scaring her readers, Atwood draws their attention to the impact of todays science. While understanding is not advanced far by whispering Boo like this, it is a first step.